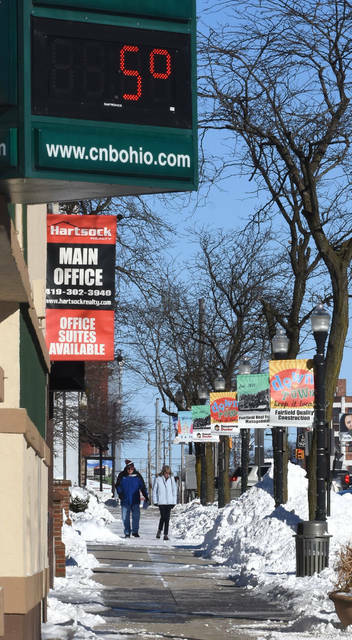 Pedestrians walk down the sidewalk on Main Street in Lima at a brisk 5-degrees. LIMA — Sub-zero temperatures pose a risk for hypothermia and frostbite and local health officials and a veterinarian say it is imperative to keep humans and pets safe in these extremely cold conditions. Lima received 8 inches of snow Saturday with the most similar amount at 7 inches in the city on Jan. 5, 2014, according to Tom Kines, AccuWeather senior meteorologist. The National Weather Service issued a wind chill advisory from 7 p.m. Monday until 6 a.m. Tuesday with wind chills as low as 15 below zero. The coldest temperatures the city has seen so far this year was 12 below on Jan. 2 of this year. Monday morning the city’s temperature was 1o below with the day high of six and night low of zero, Tuesday is expected to be in the mid 30s with a low of 30, Wednesday’s high will be 40 and low of 20 and Thursday will get colder with a high of 20 and low of 9. Friday’s temperatures are expected to be a high of 13 and low of 7, Saturday high of 21 and low of 9 and Sunday high of 20 and low of 12. “It doesn’t look like there will be anymore significant snow happening this week. There is an 80 percent chance of rain Tuesday night into Wednesday morning,” Kines said. When asked what is contributing to the cold, Kines said earlier last week there was a cold air mass that sunk down into southern Canada and up into the northern plains in the U.S. The snowstorm from the weekend left cold air from up in Canada and the northern regions of the U.S. pushed south that resulted in a very cold day on Sunday of 10 degrees and minus 10 Monday. Rhonda Pees, Ohio Department of Transportation District 1 public information officer, said employees have been out around the clock treating roads. “What we are doing to combat the lower temperatures is we are using calcium chloride, which works below the 15-degree mark that salt doesn’t,” Pees said. The solution is directly applied to roads and spray tankers apply a spray application directly to the road that melts the hard packed iced snow on roads. Dr. Walter Elrod, Lima Memorial Health System emergency room director, spoke about the difference between frostbite and hypothermia. “Frostbite is when you get freezing of the cells in the toes, fingers, nose or ears, and hypothermia is when your entire body gets to a low core temperature,” Elrod said. He advised people dress for the weather and not go outside if they don’t have to. People also should pay close attention to the elderly and young children, who are the most at risk. Lima’s Midwest Animal Clinic Dr. Jackie Insko provided safety tips for pets. “Anytime it’s below freezing, it is not a good condition for pets. Now that we are down to sub-zero temperatures, I would keep pet’s exposure outside to a minimum,” Insko said. In sub-zero temperatures dogs and cats have a potential of developing frostbite and owners should be aware deicer salt can be toxic to animals’ paws, she added. “Pet owners don’t realize the susceptibility of pets to hypothermia and not being able to keep themselves warm,” Insko said.